As a business and human rights tool and a multi-stakeholder organization, the Voluntary Principles on Security and Human Rights (VPs) promote the implementation of a set of principles that guide companies in providing operational security while respecting human rights. In April 2016, the Government of Canada (Global Affairs Canada) will be assuming the Chair of the Voluntary Principles on Security and Human Rights Initiative. This dedicated session on the VPs presents a great opportunity for the business community to meet and exchange ideas on how the VPs can contribute to responsible and sustainable mineral exploration and development. Last year, a Global Compact Network Canada (GCNC) working group, consisting of Canada’s leading companies and organizations, produced a guidance document to help provide assurance for companies implementing the VPs. 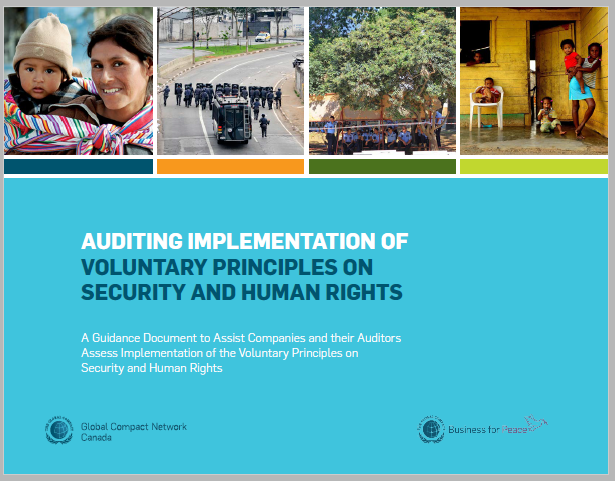 This document can assist companies and their auditors assess implementation and verify that they comply with their security and human rights policies, helping reduce potential negative human rights impacts, company legal exposure, and company reputational risks. The Global Compact Network Canada, in collaboration with Global Affairs Canada, and with support from Export Development Canada, is proud to invite participating companies and civil society organizations at PDAC to a presentation on this guidance document, as well as a general discussion on implementation of the VPs and the potential priorities and actions that Canada can spearhead during its chairmanship of the VPs Initiative. RSVP for Roundtable on implementation of the voluntary principles on security and human rights to add comments!